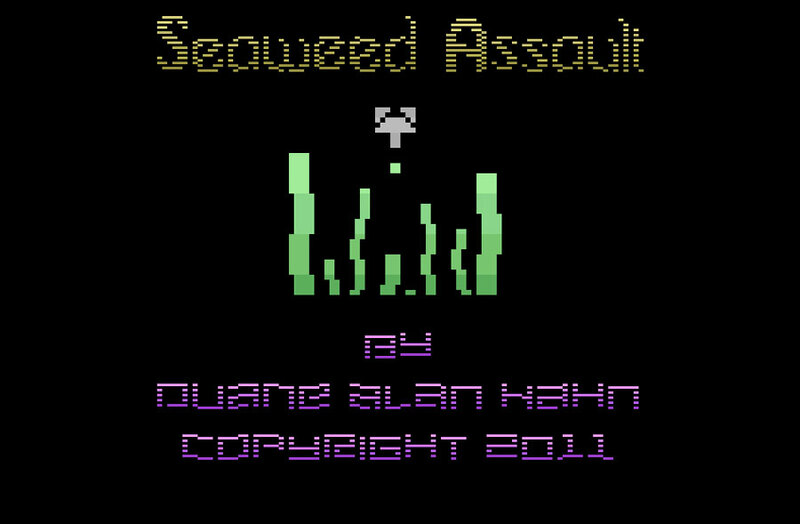 Aside from being a new game for the Atari 2600, Seaweed Assault is a well-crafted homebrew with many features that show an understanding of the platform and offers good gaming. It opens with an attract mode that turns into an automated demo. Control-wise, you have the ability to configure the game for left-handed play (via the Select switch) and rotate the fire-button to the upper right position. Pretty slick! 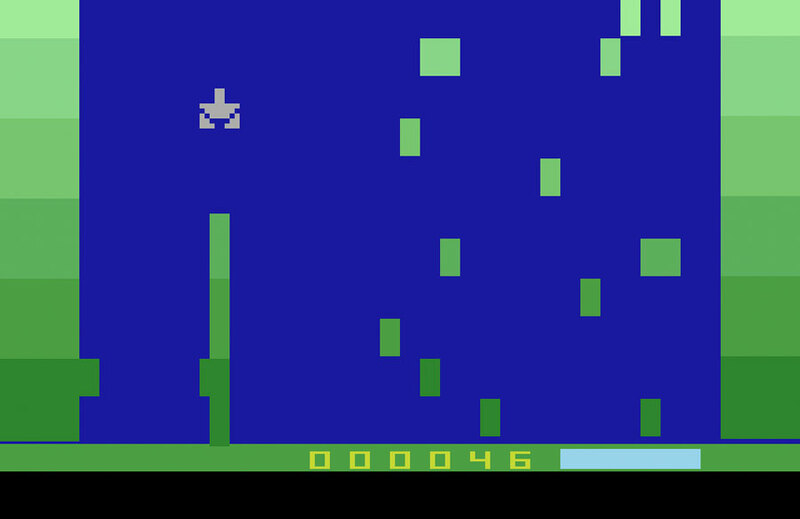 This game makes use of the Atari 7800 pause button and even extends this feature to the 2600 via the Color/B&W switch. Subtle touches like this make Seaweed Assault a really engaging homebrew game. You play as Captain Nalad Modnar and are part of an advanced underwater civilization. It's your duty to patrol your section of the ocean in a semi-organic submarine called the Manatee. Highly aggressive seaweed surrounds you and it keeps trying to replicate faster than you can shoot. Use your torpedoes to blast any bits of seaweed that appear before they clog up your sector and spread to others, making it nearly impossible for anyone to travel. Don't let the seaweed strangle your civilization to extinction. This single-player game has you piloting a submarine in an effort to battle an invasive strain of seaweed. Each piece you blast disappears from the screen. Your sub moves in 8 directions, but don't linger as this causes an agressive length to surge upwards towards your sub. Your only escape is to dodge left or right. Shooting this aggressive strand has no effect. Being a semi-organic submarine, the Manatee has the ability to heal itself, but you'll want to keep an eye on the health meter at the bottom of the screen. You'll also be alerted to the aggressiveness of the seaweed. As you blast it, the seaweed gets a bit tenacious and regenerates faster. So, you can't stay still, the more you blast, the more it grows... Are you getting the idea this is no simple-minded game? Obviously the savage regenerating seaweed is bad for your health, but there are other enemies... as well as power-ups. Wrothopods are a protected species that attach to mature seaweed in a symbiotic relationship. Your torpedoes can't harm a Wrothopod, but if you hit one, the damage will be transferred back to you! For every 100 bits of seaweed you blast, a health canister is dropped in from above. The faster you get to it, the more points and health is will be worth. It changes color as it's vale drops. 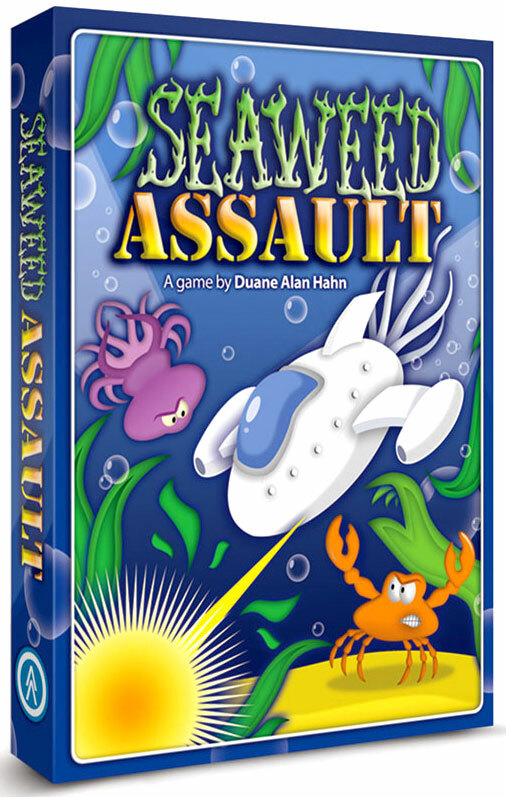 Seaweed Assault is a clever game that plays well and contains several elements that really set it apart. It's look and feel makes it fit in with many of the games I bought in the early 80s. Some have said it's like a mash-up of Centipede and Yar's Revenge. I can see the comparisons in Seaweed Assault's game play, but also because it's a fun game with innovation and replay value! The graphics are deceptively plain looking - except for the moving fins of the Manatee - but the game play is pretty cool and offers enough options that the game stays engaging. If it's no longer for sale as a complete (box, manual, cart) you should be able to find a ROM file - sanctioned by the developer.